Nature is controlled by no one. She is without leaders. It is often said that mankind cannot survive without Nature but that Nature can survive without mankind. The truth behind these statements lie with the transformative character of energy in Nature. The word “transformative” means to change in form, appearance, or structure. A “structure” is the relationship or organization of the component parts in a system. The process of evolution in Nature is an example of transformation where changes in structure take place at many levels. Energy flow in Nature is another important example of transformation. Energy is the force that drives Nature. Energy flows. It is the currency of Nature. Nature, from the smallest atom to plants and animals and all of her ecosystems, are energy transporters and transformers. Everything within Nature, including ourselves, function by receiving energy, transforming that energy into a useful form, and then storing the transformed energy until it is called upon to be used as a driving force by the immediate system or a connected system. The forms that energy takes are constantly changing. The most common example of a transformative Nature is the energy flow from the sun to plant leaves. The leaves of a plant, like the mangrove shown above, transform the sun’s photon energy and store it in a green chemical known as chlorophyll. 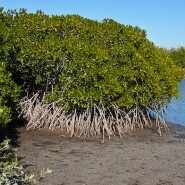 In this transformed state, the sun’s energy is now available to be used by the plant or by organisms at the base of the mangrove plant who eat the plant’s dropped leaves. You eating a salad is an act of energy transformation. The salad’s energy stored in the leaf’s chlorophyll becomes transformed through the process of metabolism and stored inside your body. Your body’s energy storage medium is a chemical called ATP. It is very important to note that it is Nature’s processes of transforming energy that drives and controls Nature. Mankind does not have that power. One of the most arrogant fantasies of modern man is that Nature functions in some sort of predictable equilibrium that can be manipulated and controlled by we humans. In reality, there is no equilibrium and there is no steady state in Nature because energy is always flowing into Nature’s systems and then flowing out of Nature’s systems. Nature is always changing because this energy is constantly being transported and transformed. We humans cannot possibly manipulate or control Nature because we do not have the capability of transforming Nature’s energy. Because Nature’s systems are processing energy in changing environments (birth rate, weather, predation, death rate, etc), the future status of any one system is unpredictable. Nature’s dynamic equilibrium is always moving and always changing as Nature’s resilience mechanisms work to adjust changing conditions. There is no such thing as a “steady state”. Therefore, it is impossible for we humans to predict and control Nature. If this idea is hard to grasp, go sit in a forest, a meadow, or a seashore and try to find patterns and processes that are exactly alike. No two trees are exactly alike. An example of mankind’s folly in the face of a transformative and changing Nature is a government permitting the killing of certain animals to control the population based on some biologist’s estimate of population equilibrium. Reference points and target populations are calculated based on the erroneous assumptions of equilibrium and steady-state. But, the calculated targets are always moving unpredictably because Nature is always changing as it transfers and transforms energy.